Online marketing for perfumes seems to go beyond the reach of the spider. Some of the keywords and algorithms relating to every man's most desired search terms has been squeezed out of the Google concept and been injected into a mass marketed perfume from China. I know nothing of the scent, but according to Need Coffe Dot Com, after a simple spritz of Google Eau de Toilette, the men amongst you will "Find yourself at the top of any SERP and get plenty of conversions with this new fragrance that will have women clicking through to you every time." For more laughs read the rest of the article here. Many thanks for Fragrantica for the story and links! of them. But since they are all about stolen branding, I figured I could just use their photo as long as I provided link to the other fraud they're showing. 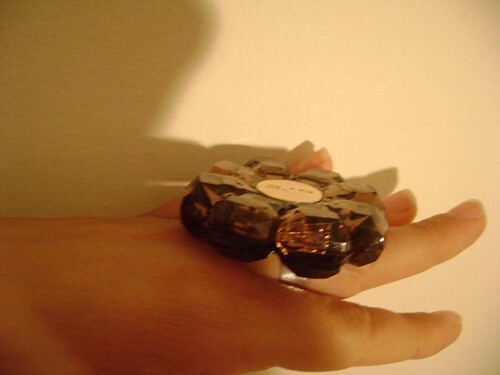 I have added a new product to AyalaMoriel.com - poison rings from my private collection of perfumeable collectibles. Every two weeks, I will be posting a different item. My collection includes both vintage and new poison rings. The price stated is including the solid perfume which they will be filled with. Poison rings were historically made to carry poison to kill one's enemy (or yourself if your enemy catches you!). I decided to fill them instead with something less harmful - a beautiful, creamy perfume that will release its scent through the ring's secret compartment to make your day filled with a subtle scent. And if someone ever kneels to kiss your hand, they'll be bound to never forget you! You can select a scent from the perfumes suggested (for each ring I give a few suggestions of fragrances that will go well with its look and particular character). Or you can ask for a custom made perfume for that, for an additional fee. 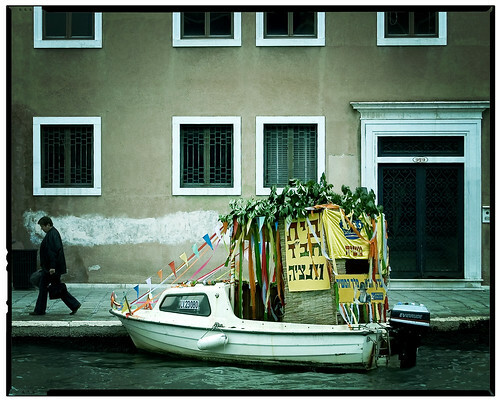 To all SmellyBlog readers who are celebrating Sukkot - Happy Holiday! May your sukkah be blessed with the the 7 Ushpizin and loving friends and family! Watch out for the October issue of Fashion Magazine hitting newsstands this week: Ayala Moriel is featured on page 200 in the "Shops Vancouver Beauty Reporter" column by Kate McLennan. hvönn og sólarlag, originally uploaded by saraella. Angelica root absolute, on the other hand, is a completely different story. The specimen I will be talking about was not only grown in a different soil, it is also a different species: Angelica sinensis. It was grown in China, where Angelica has been used for thousands of years for its medicinal properties and is almost as important as ginseng. 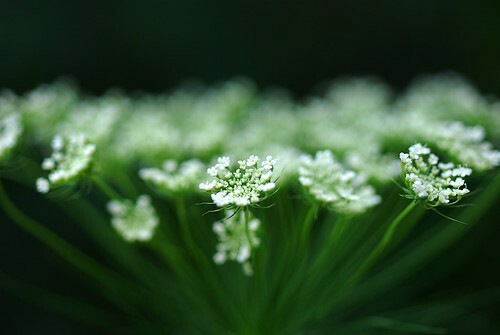 The Chinese doctors use as many as 10 different kinds of angelica, mostly to treat women’s fertility issues but also to strengthen the spirit (Julia Lawless, Encyclopedia of Essential Oils). This particular angelica absolute is dark in colur and semi-viscous in texture. It has an incredibly musky and smoky fragrance and I can see it working beautifully in spicy and warm orientals and leathers. Another use for angelica is in chypre and fougere compositions, but I feel that the root oils might be more fitting for these uses. Strangely, it shares some similarities to immortelle – living on the borderline between herbaceous and bizarrely sweet. I’ve used it recently in two of my mods for a perfume called Gaucho which I’ve been working on for the past 7 years. Although it seemed to have provided an interesting counter points to the other elements in that perfume (dry-green and coumarin-bittersweet) it did not provide a breakthrough. Plus I made the mistake of also using the angelica root oil with the celery dryout (which is definitely not what I was looking for!). The angelica absolute on its own might just be the answer for an animalic musky note sans the lactones sensitization issues that costus poses. It’s by no menas a substitute for costus, but it may provide the aspects of costus I am wishing for in this composition. After all, being named after a Gaucho just asks for some animalic elements! Angelica, originally uploaded by *Sakura*. The species Angelica archangelica is originated in Europe and Siberia, where it is used for various medicinal and folkloric uses. Since antiquity, it was considered to strengthen the heart, stimulate circulation and the immune system and was used in centuries for treating various bronchial conditions such as colds and coughs as well as indigestion and promoting the appetite, relieves rheumatic inflammation and can be used as a urinary antiseptic (Julia Lawless, Encyclopedia of Essential Oils). Candies made of angelica stalks are also popular in France and Spain (in the US they may be found bearing the name “French Rhubarb”). If you are curious about how to make them, there are a few links to recipes below. I even found an illustrated recipe for Angelica Pie! One of the earliest Aqua Mirabillis recipes, called Carmelite Water (it was originally formulated by the nuns in the Carmelite abbey in France circa 1611). Recipes for Carmelite Water vary, but they all containt angelica and lemon balm leaves and lemon peel and orange flower water, and in addition to that various spices, usually coriander, pepper, nutmeg and cinnamon. It was taken internally as a liquor and also applied on the skin for its refreshing fragrance. Angelica as I first knew it was peppery green and very intense. Somehwere between over eccentric parsley, horseradish and raw green pepper.This was a steam distillation from the roots, and was grown in France. I’ve used it three times only, which is as I said, very unusual for any note in my collection to be so rarely used. 3) In one accord, in a brave moment where I wanted to just use Angelica and not be scared of it. I blended it with a few notes including cloves, oakmoss, patchouli, vetiver, champaca, rose and clary sage. It turned out smelling like fedjoia – that peculiar tropical fruit that resembles a green passion fruit from the outside and an under ripe guava from the inside. I was left amused and just left it at that. Few years later, I received a sample of Angelica Root Oil from the same species, only grown in India and distilled from the roots. Needless to say, this is a completely different story: while still being very green, it has far less of the harshness and tenacity that the seed oil I mentioned earlier possesses. It is by no means a “soft” note. It is still sharp. But it’s definitely not the same angelica I met before. This Angelica archangelica root oil is musky, animalic, earthy. It even resembles costus root ever so slightly. I have a feeling that I won’t only be running out of the sample fast enough to justify ordering it any time soon. it has a very appealing, mysterious yet familiar almost paper-like quality that reminds me of a Chinese apothecary, in a good way; I may even use it in a perfume mod or two in the near future. 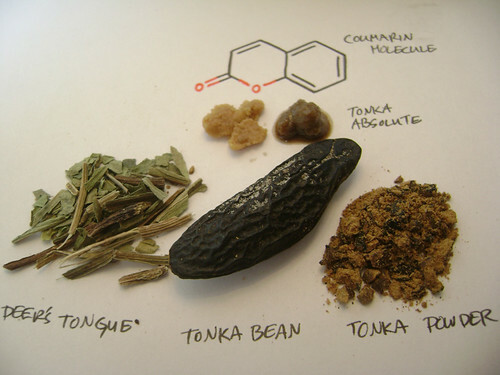 Angelica seed oil is also produced, but is much harder to come across. It is lighter, fresher and spicier, not as earthy and musky as the root oils are. Angelica Kult, originally uploaded by Jari Kaariainen. As a preparation for the first class in the Botanical Alchemy (about the origins of aromatics), I have set to prepare some aqua mirabilis for demonstrating a liquor that can be worn as a perfume (or vice verse). The only recipe I found was for Carmelite Water. However, the recipes were vague (using measurements such as pinches or no measurements at all! ), plus I had a shortage in lemon balm leaves. So I decided to modify the recipe to my liking (and limitations). Absolute Angelica, originally uploaded by Ayala Moriel. I will let you know later how it turned out after maturation and filtration. 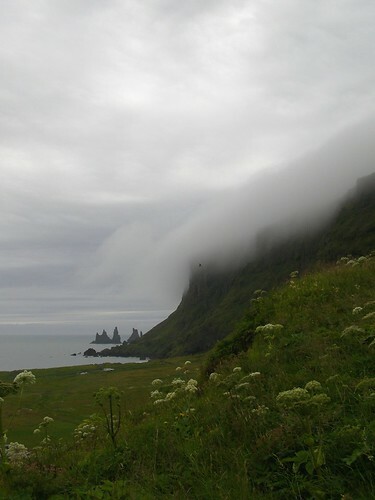 Þoka og hvönn - Fog and angelica, originally uploaded by Harpa J. It is no co-incidence that as of yet, angelica is nowhere to be found in a single perfume in my collection. For the longest time, I had the toughest time tolerating being in the vicinity of this particular note. To the perfumer, each note has its own unique characteristics and can play an important role in a perfume. No building block should be neglected, and a good perfumer should really know better than to impose his own personal preferences on his compositions. I have always followed this principle, creating perfumes from fragrance families that I don’t care for my own personal use, or employ notes that I am not particularly fond of. But when it came to angelica – I have garnered very little success in my attempts to overcome my personal prejudices. It rarely happened to me before with any of the precious botanical essences that I’ve met on my path of perfumery. But angelica has simply made me ill if I got near it. The same feeling I would get just before fainting or “seeing black”; the same near-nausea I got when I was harvesting fava beans, green or dry, and the combination of sun-stroke and blood-drained brain after bending for too long, along with smelling the poisonous fumes emanating from the abovementioned fava beans and other weeds, them too, over exposed to the heat of the sun. So, the following posts will be dedicated to angelica, as my relationship with this difficult note shifts and transforms. 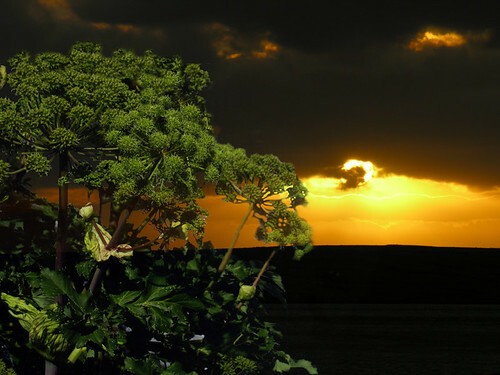 I will discuss some of its characteristics, medicinal and folkloric uses, and the history of using angelica in perfume. Finally, I will share with you bits and pieces from my journey with angelica in my recent creations and experiments. Hardware, originally uploaded by Ayala Moriel. If you think perfumers have an easy job, think twice. 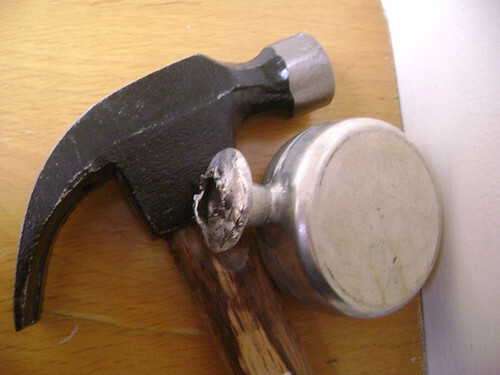 When it comes to independent ones, a day's work may even include using some toolbox items such as a hammer and a screwdriver. Such as when one needs to open a traditionally-sealed can of Rose Otto from Turkey. Perhaps I've never came across these because I've never stocked up on more than an ounce of Rose Otto. This time I took the plunge at 50gr of this precious oil, the crop of year 2006, priced at 11,400 per kilo. Was it worth the work? Oh yes it was! 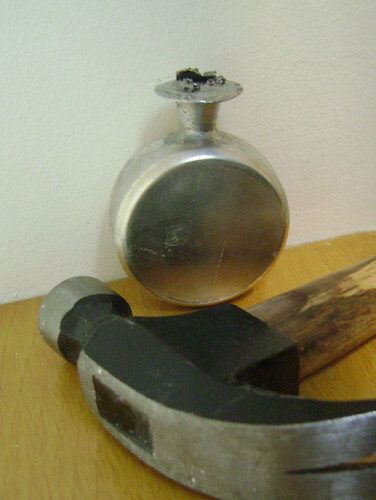 In contrary to the crude and industrial looking can, the precious oil seems even more precious. Packaging of raw materials is first and foremost about practicality, but in this case it also created anticipation... with a surprise in the end (for those who waited long enough like I did!). My studio will smell like roses for a while, even though I haven't really lost any of the scent through the crude process of opening the rose-otto soaked cork crumbled and spilled around, spreading the fine scent of pure Anatolian roses. Fumeasons, originally uploaded by Ayala Moriel. Zodiac Perfumes, originally uploaded by Ayala Moriel. To celebrate the new website (and encourage you to use it...), I have decided to hold a monthly draw for all of you who have ordered online. Each month, I will be giving away one Zodiac Parfum Oil (as pictured above) with the Zodiac sign of the month. The draw in September will be for one bottle of Virgo parfum. October will be Libra, November - Scorpio; December - Saggitarius; January - Capricorn; February - Aquarius; and so on and so forth. The draw will take place on the last day of the month and the winners will be announced that day on SmellyBlog and to my mailing list. If you want to read more about the Zodiac Parfums, you can only read about them on my old website. 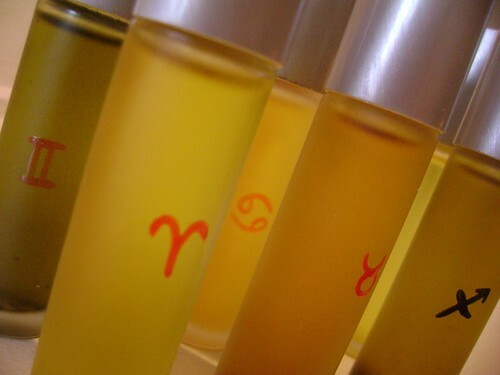 You can also read reviews of the Zodiac perfumes on Basenotes (or add your own review!). Ayala Moriel Parfums will be featured on TV today, 1pm PST on Living Vancouver, demonstrating the process of fragrance consultation and custom perfume creation for Margaret Gallagher. You can also watch it online (it will be on CBC website for the next 3 months). For those of you curious about the perfume I made for Margaret - it turned out beautifully, being equally fresh and sweet, floral and spicy! Join Tea Master and Folkloric Herbalist Dawna Ehman, and Perfumer Ayala Sender for a series of workshops designed to deepen your understanding and appreciation for the nature of plant essences used in perfumery, herbalism and tea culture. Don’t miss this unique opportunity to be guided on an experiential journey that combines beautiful visual presentations, hands-on experience, your own working manual of formulas & blending charts as well as chance to appreciate an array of plant based elixirs, teas and perfumes. The 7-week series is ongoing throughout the months of October to December. Although each weekly class can stand on it’s own and is not reliant on a prerequisite, you are encouraged to participate in the flow of each class moving into the following one, as we build upon our new found knowledge and experience for natural aromatics. We aim to fulfill the deepest interests of individuals about the fascinating interconnections of aromatics in perfumery, herbalism and tea culture by facilitating this series dedicated to self-directed study and passionate hands-on experience. For more information & to register please email us or call: (778) 863-0806. You may register for a single class at the price specified, or sign up for the entire series and get an early-bird* discount. **That means that you get one theoretical class for free. We begin our aromatic journey with the prehistoric origins of incense and follow the evolution of aromatic plants by noting their developments throughout recorded history up to the 21st century - including an outlook on the future of aromatic plant production for use in herbalism, tea culture and perfumery. When: Thursday October 11, 6:30 p.m. to 8:30 p.m.
Part one follows the historic evolution of aromatic plant use with a focus on incense, perfume, tea and herbalism. We journey back in time to the prehistoric ritual use of incense and then on to the ancient civilizations of Egypt, Greece and the Middle East to explore the developments of perfume. We discover tea in ancient China and take a brief look at the unique usage of aromatic plants in medieval herbal practices. Class will close with a guided meditation on our outlook to the future and our intentions for making a positive change in the ecology of aromatics. Learn about the powerful yet subtle language of healing & beauty in aromatic plants. In this fascinating class we will discover how plants form impressions within our own psyche and we will learn to appreciate the myriad relationships they have to our emotions and memories. This class also covers safety guidelines for using natural aromatic plants and extractions and offers a unique opportunity to appreciate some of the most precious botanical aromatics available. In this lesson, we dive deep into the realm of plant energies and learn to appreciate the unique correlation between the energetic nature of a plant and what it may reveal through the emotional response of both our nervous system and our memory. We will also observe important factors that influence the energetic properties of aromatic plants (including seasonal shifts, growing methods, harvesting, processing and storing methods). We will begin our exploration of perfumery and personality and also look at how different forms of aromatic extractions of the same plant reveal varying levels of energetic concentrations and consequent physiological responses. Finally we will explore how to incorporate aromatic plants into our lives as a way to enhance our emotional well being. Exercise: Tea ceremony as a meditative practice and an opportunity for mindfulness. In part two of The Living Language of Plants, you will acquire basic tools, tips and guidelines for assessing raw materials and for using them appropriately and efficiently. Through exercise and demonstration you will learn how to determine quality (i.e. : how do I know if a material is natural or synthetic? how to tell if it’s fresh or stale?). We’ll also discuss ratios and proportions, how to troubleshoot (i.e. : clean your skin of sticky resins and oils, or how to avoid skin irritations) and learn how to use plant aromatics responsibly and respectfully- to ensure your pleasure and safety are not compromised. Exercise: Assessing qualities of synthetic vs. natural aromatics through demonstration and assessment (e.g.. pure vanilla extract vs. artificial vanilla flavor; pure attar of rose vs. rose fragrance oil). Alchemy Notebook: Tree of Stars, originally uploaded by Ninth Wave Designs. Uncover the many methods used to extract plant essences, and experience precious botanical essences from around the world. We will also explore the mysterious connection between plants and humans, and how plants can assist us to live a full, healthy life and in harmony with our environment. Explore the mysterious connection of 'form and function' between plants and humans, and observe how plants can assist us to live a full, healthy life in harmony with our environment. We’ll learn about he correlation between the three layers of our skin (epidermis/dermis/subcutaneous) and the three organ sections of plants (flower, leaf & stem, root), and how to transform plant matter into healing infusions, macerated oils, tinctures and salves. Exercises: Comparison between plant structure and the human body; making an infused oil for healing and skin care purposes. Uncover the many methods used to extract plant essences, and experience precious botanical essences from around the world. By the end of this lesson, we will understand the different distillation and extraction methods of aromatic plants, and learn the difference between essential oil, absolute, hydrosol, floral wax and concrete. Sampling and demonstration of the essences that result from these processes will be presented so you can truly understand the differences between the various essences and their qualities by using your senses – sight, touch and smell. Discover the artistry and science of blending pure aromatic substances when creating unique loose leaf tea blends and natural botanical perfumes. We will also discover the unique interrelatedness of tea and perfume, such as perfuming teas with flowers and using tea notes in modern perfumery. There will be opportunity to sample tea blends, perfumes, assorted plant elixirs. How much: $25 includes materials (space limited to 10 students). In this lesson you will learn about the basic principles of tea blending and the different stages of the tea-tasting experience: you will learn how to reveal the aromatic bouquet. We will also discuss and compare the various methods of processing teas (i.e. : the differences between white, green and black teas) and learn about how teas are graded. And last but not least – we’ll demonstrate with samplings the two methods of flavoring tea - aromatizing and perfuming, and learn about the difference between the two. This lesson will be dedicated to exploring both traditional and modern approaches to blending a perfume. We will discuss the “fragrance pyramid” (i.e. : top, heart and base notes), and reveal the different methods of composing perfume such as the structured “Accord” approach (i.e. : building horizontal and vertical chords), the exploratory or intuitive approach, working from briefs, and more. You will experience first-hand the development and structure of a natural perfume - on your own skin, and as we walk you through the different aspects that went into designing it, both conceptually and structurally. Exercises: Evaluating building blocks (top, heart and base); perfume demonstration: walking through the process of perfume creation from concept to creation, and pulling apart the notes of a particular perfume on a scent stripes to analyze its structure. Learn how to use quality aromatic botanicals (herbs, loose leaf teas, essential oils, absolutes, concretes and floral waxes) in the formulation of teas, tisanes, herbal first-aid preparations, and perfumes – both solid and liquid. This class is entirely “hands on”. All materials needed will be provided. How much: $75 including materials (space limited to 6 students). We begin our hands-on workshop of formulations with a brief discussion of common aromatic herbs (including therapeutic flowers, roots and leaves) that can prepared for practical daily usage. We will explore the significance of synergy when formulating herbs for potency, longevity and efficacy. We will learn to appreciate the application of herbs in several unique and creative formulations including dream pillows, healing creams and love elixirs and take a brief look at the formulating practices of some of the world's oldest herbal traditions. This lesson is dedicated to your first attempt at blending your own natural perfume. From a given aromatic palette, you will select your own favorite notes to make a perfume that will bring you both pleasure and pride. Drawing on the knowledge from the previous class – about the classifications of notes, volatility rate, perfume structure and blending approaches, you will make a perfume that is simple yet elegant and with the guidance of an experienced natural perfumer, is sure to smell good and have a good and lasting power. This will by no means make you a “perfumer”, but it will give you a hands-on idea of what being a perfumer is like, and perhaps even inspire you to further deepen your studies of natural perfumery. Join us for a fabulous evening of aromatic cooking- using fresh herbs, freshly ground spices, loose leaf teas, and essential oils- in both savory and sweet dishes. Your will be given a collection of recipes to try at home, and receive guidelines for aromatic cooking. As an inspiration, we will be preparing a “Winter Solstice” feast (which we will enjoy together at the end of the class, of course!) including an appetizer, a main course, a dessert and beverages to accompany the meal. We hope that by the end of the class you will feel inspired to use your own aromatic culinary mixtures at home and feel encouraged to express your creativity in the kitchen, using the best quality aromatics you can source. As we’d like to surprise you, we won’t reveal the exact menu until the class itself. We hope to repeat this workshop throughout the year, and change the recipes according to seasonal and regional availablilty - all so that we can support local farming as much as possible in our cooking & best exemplify what we believe in through our culinary actions. Cooking and baking with tea seed oil and other nutritious oils. Alternatives to dairy and wheat (selected recipes prepared will be vegan or dairy and/or wheat free). Concocting specialty teas and beverages – either chilled or warm, according to the seasons. With a focus on preparing savoury appetizers, salads and main courses. Learn surprising ways to use freshly ground spices, hydrosols and essential oils when baking pastries and exotic desserts from around the world. Learn how to concoct your own teas and beverages for entertaining or for accompanying a meal. By using herbs, spices and flower waters, you will learn how to transform an ordinary drink into an unforgettable treat! Learn the basis of 'inner wisdom-outer beauty'. We will learn to prepare beautifully fragrant and sensual body products using simple and luxurious botanical elements that are readily available and use the benefits of essential oils and other fragrant materials to add another unique dimension to your daily body care rituals. By the end of the class, you will take home with you at least one body product, plus a handbook with additional recipes that you can safely and simply create at your own home. Learn the fun and magic of making your own body care products from readily available ingredients. We will guide you, step by step through a detailed process of body care preparations using the finest natural aromatics for body care. Class notes and formulas include tea based facial steams, washes and tonic waters; hydrosols for healing and beauty; plant based shampoos; herbal infused oils & butters; perfumed sugar body scrub; aphrodisiac perfume oil. In this final hands-on workshop we learn to perform enjoyable and safe self-healing techniques that use aromatic body care products prepared in the earlier part of the class. Discover how the benefit of incorporating such techniques with aromatic elements will nourish your mind, body and soul and encourage a daily personal ritual of pleasurable body care and beautification. Class notes and formulas include: Cold water rinse in facial care; pre-shampoo scalp massage; self massage in an oil bath; reflexology pressure points of the hands and feet; self-massage techniques for headache and reflexology; temple massage with lavender oil. Rosh Hashana 2007, originally uploaded by Ayala Moriel. No matter how simple, beet salad is sure to impress. The sweetness of beets always comes through as a surprise – this is not what you would expect from a vegetable! And if you are not taken with its peculiar flavour - than at least you’ll be shocked by thei intense colour of beets, which paints everything it touches with a jewel-tone. Beets simply cannot be ignored even if you try hard! I’ve always loved beets. I can’t remember myself ever not liking beets (as long as they are cooked, that is; raw beets do nothing to me). I can never forget sitting at the train-long table at my step-grandparents’, a table full of cousins (all boys!) all sitting patiently and quietly waiting for all the rituals to be over so we can eat all the delicacies laid down in front of us (all, with no exception, made from scratch by my step-grandmother and great-grandmother – no one was allowed to help with the cooking!). Somehow, without nobody noticing, in between the Seder’s few glasses of grape juice, I managed to eat my way through the little salad plates full of beets that my little hands could reach. Or was it Sukkot? It doesn’t matter. Because in every Jewish-Morrocan holiday table that respects itself, there will always be a beet salad of some sort – either shredded or sliced – to add colour to the meal. 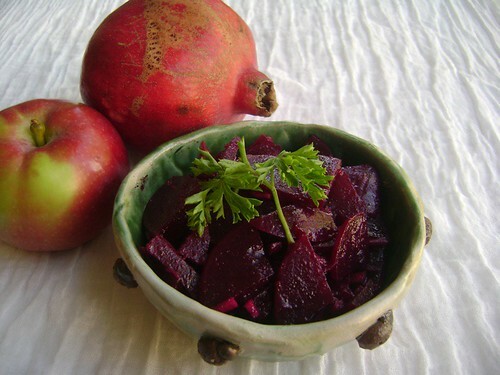 In the village where I grew up, beets seems to symbolize the very essence of rustic yet festive cooking. In every celebration in my village, there will be at least one beet salad. That’s why I can’t really agree with Tom Robbins that beets are melancholy! "The beet is the melancholy vegetable, the one most willing to suffer. You can’t squeeze blood out of a turnip... "
In Rosh HaShana, beets have an added meaning – it becomes a symbol for “banishing the enemies”. This is simply because the name for beets seems to have the same root as “banish” in Hebrew. So I wish for all of us that we will have no enemies at all, and will be able to enjoy our beets without thinking such nasty thoughts. Remember, the best way to banish an enemy is to turn him/her into a friend! Any recipe for a good beet salad starts with getting the right beets – they need to be not too old (or else they will be too fibery and not sweet enough), yet not too small either (because it’s more difficult to peel and cut beets that are very small – the crown that connects them to the leaves and stems take over too much of the root and there isn’t enough left for eating!). The following recipe is easy to make and keeps well. You can make it a day or two ahead of the occasion you wish to serve beets for - and it will only improve with time. 6-8 fresh beets, unpeeled, uncut, with stems removed. Place the beets in a large pot with enough water to cover the beets. Do not cut or peel the beets, as this will cause them to “bleed” out all their colour and flavour! Boil in water over medium heat until soft, but firm enough (the beets should not be mushy – cook until you can poke through the beets with a fork). As soon as the beets reach the softness desired, rinse them under cold water, and remove the “skin” the peel immediately with your hands – as soon as you can without burning your fingers. If you wait too long until the beets cool completely, the peels will refuse to leave the beets and you will loose a lot of the beets’ flesh, and create a lot of work for yourself (as you will now need to peel them with a knife!). Slice the beets thinly (I usually cut them into quarters before slicing them). Add the lemon juice, cumin and garlic, and olive oil if desired. Serve at room temperature or cold, garnished with parsley sprigs. Beet salad is especially wonderful when served alongside other salads and dips. Tahini makes a particularly great accompaniment to beets, served with fresh flat bread or a Challah. - You may also add chopped parsley to the beet salad. - Add a dash of balsamic vinegar and seeds of sour-sweet (deep, dark red) pomegranate, omit garlic and cumin. - Instead of slicing the beets, grate them with a large grater. Use only lemon and cumin for dressing – but if you wish you can also add a bit of pressed garlic. Out of the Arc, originally uploaded by Tirau Dan. Happy New Year to all of us celebrating Jewish New Year's Eve today. 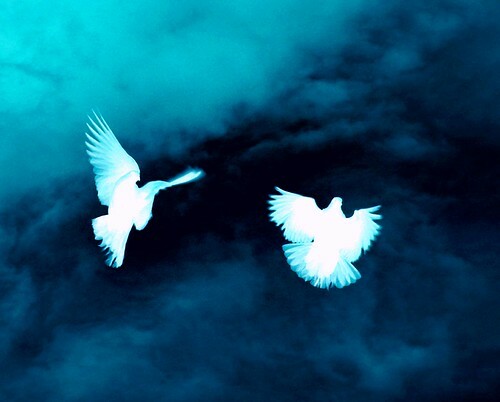 May this year be a year of peace, above anything else. The maple-like nuances of immortelle absolute are used here along with sweet orange, cinnamon, wheat and three different infusions of vanilla, creating a perfume that truly captures the aroma of cinnamon-pancakes and Tire d’Erable (“taffee on the snow”), an inseparable part of the Quebec heritage in the Maple Harvest Festivals. You’ll find it hard to resist licking this perfume, but it will prove to be a true friend for a love-injured heart. Immortelle l'Amour will be available as parfum extrait and in a tea-form. * Immortelle l'Amour will be launched for Fall-Winter 2007-2008, along with a complementary tea blend, and will be available exclusively through Ayala Moriel Parfums starting November 2007. Immortelle l’Amour, my new perfume created for the chilly fall and winter months tells the story of undying love. The formula was ready long ago, yet it was particularly difficult for me to name the perfume. Although I had a few names – all with an equal appeal of both meaning and sound – I had to choose the right one and know it’s right before releasing the perfume. When it comes to matters of love, it sometimes takes courage to say the truth. And so I ended up with the name that seemed to me, at first, to be too romantic, bordering on the cliché… Once I realized this is the right name, the best to describe both the botanical and inspirational origin of the perfume, I felt the time was ripe and it was just a matter of picking a particularly chilly day in November to release it to the world and add some warmth when its most needed. Immortelle l’Amour was inspired by the immortality of true love and the unique aroma and energy of the everlasting flower – Immortelle. Immortelle is also known as helicrysum or everlasting flower. The essential oil is prized for its unusual healing properties, including pain relief and skin rejuvenation. The Latin name Helicrysum points to its connection to the sun and its own healing properties, bringing a soothing warmth to the soul. In Immortelle l’Amour, the helicrysum (immortelle) flower absolute is used as the main theme for the perfume. 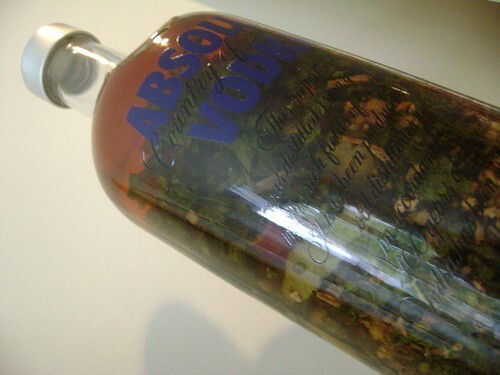 Unlike the essential oil of helicrysum, which is herbaceous and honeyed (very similar to both chamomile and marigold), the absolute has a dark, ambery fragrance with a somewhat spicy-earthy underlining note, reminiscent of both fenugreek and maple syrup (incidenatally, both immortelle and fenugreek are used in the flavour industry to create a maple-syrup flavour. Malawach, originally uploaded by Ayala Moriel. 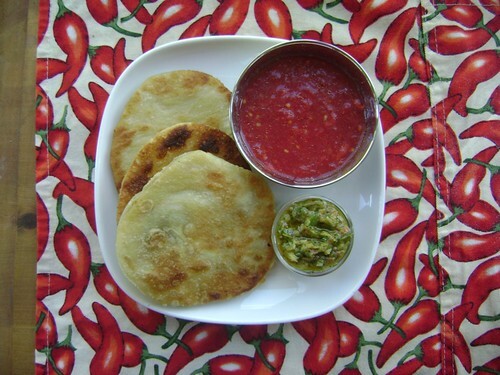 Malawach is a Yemanaite flat bread, made of leafy dough (more similar to that of croissant rather than filo dough) that is pan fried and served with the traditional Yemanite condiments: hilbeh (a fenugreek paste, which will make you smell of fenugreek for an entire week following the feast), zehug (a very hot paste made with pepper, garlic and coriander). In Israel, these can be had with no hard work or Yemanite root, via the frozen section of most supermarkets and requires minimal preparation. In Canada, of course, nobody heard of Malawach, let alone capitalize on it as a frozen product. And so me and my brother Noam hd no choice but to make our own, from scratch. We set off today to make the most delicious brunch possible – one that left us un-hungry for many hours to come (we ate around 11am and weren’t able to eat anything else until about 9pm!). I took care of the Malawach, and my brother made the zhug. Here is the recipes for what we’ve made – and I hope you will feel inspired to make them yourself. They are simply delicious and slightly addictive. Dissolve the salt in the water and add flour slowly while stirring with a whisk or a wooden spoon. Add flour just until the dough becomes soft and but not sticky. Roll each portion of dough into thin sheets (about 0.5cm thin). Spread margarine all over the sheet, and than fold each corner into the center to cover the margarine. Roll the dough until thin again and repeat the process of spreading the margarin and than folding the dough in. Fold the dough into 4 and roll it again several additional times (2-4 times). Let the two sheets rest on the counter, covered with a towel, for 30 minutes, so the dough rises a bit. Roll each sheet very thinly (about 0.25cm). With a medium sized bowl or a large, round cookie cutter, cut the dough into circles, small enough to fit your frying pan. Fry the circles in vegetable oil on both sides, and serve with the condiments described below - tomato dip and zhug. Sauté all the banana peppers in olive oil over medium heat until the peppers soften a bit. Add 2 cloves garlic and the jalapeno and sauté for a couple more minutes. Remove the pan from the heat, and using mortar and pestle, add the spices and mush the mixture until it achieved a paste-like consistency. Transfer to a clean jar. Chop the cilantro and add to the jar, and mix well. Serve as a condiment along with Malawach, and also great in sandwiches and an addition to sauces and marinades. Using a grater, grate the tomatos (including the seeds) and place in a bowl. Add crushed garlic, salt and olive oil and serve together with the Malaawch and Zhug for dipping. The new website for AyalaMoriel.com has now gone live! Finally, I have images for every single perfume and product! I hope this will make it easier for you to pick which form of fragrance you'd like to use. To name just a few of the other new features on the website- there are a few interesting pieces of information, such as info about the different fragrance families and other articles. And last but not least, when you click on a note that appears in a perfume, you can read more information about it, and also see the list of all the other fragrance that have that note. There is still lots of work for me to do on this website (such as and images for every single note that appears in my perfumes! They will appear to illustrate the pyramid of each perfume; but that requires some special programming from my in-house geek, and I shouldn't pressure him to much!). The Fragrance Questionnaire will eventually be in an emailable form format as well (which should make it easier for both you and me!). And also, in the near future, you will be able to add your own reviews automatically online for each perfume. For now, you can read other customers' reviews, and if you'd like your own review to be added, just email it to me and I will post it on the reviews page for now. We have just one little problem which I am hoping will be fixed by the end of the day - you can't order sample packages from the new website yet (even though they are listed and have all those photos I've taken of them). It's just a technical glitch. If you want to order a sample package and it's not working for you on the new website, you can still order them the old-fashioned way from my old website (which will remain on the domain Quinta-Essentia.ca until further notice). Any feedback or comments are appreciated - hope you enjoy the new website and find it fun, useful, informative and pretty to look at - this is what I was trying to achieve! Terry Sunderland, the most talented graphic designer alive! May you both live happy, long and healthy lives, and continue to prosper and continue doing what you do so well! I recently came about a short interview with Jacques Polge on Icon magazine (fortunately it was short enough for me to read it in the store – the magazine costs 5 times the price of a “normal” magazine, looks like a paperback cover book, and contains mostly artistic-version photographs of products that look quite mundane on the shelf but very interesting in those photographs). Though the interview was short, it was effective enough to intrigue me and make me try to look differently at the Les Exclusifs collection. Reading what the perfumer had to say made it all seem a little less pretentious. And why? Because his passion comes through. And being known to be a quiet person who prefers not to speak, I could see that the words, chosen carefully, were in fact meaningful. - Jacques Polge was the one who resurrected the Chanel classics from the oblivion of a lab formula book, and re-issued them in the late 70’s, as the “Rue Cambon” collection. - The inspiration for No. 18 was not the giant pearls and gold jewelry in the Chanel jewelry boutique, but rather – the discovery of the ambrette seed note in Bois des Îles. Jacques Polge was so intrigued by this note he decided to dedicate an entire perfume to that precious note, and rightly so. Well, I may not like the Les Exclusifs any more than I did before after reading the article, but I appreciate much more the inspiration and thought that went into them and they seem just a tad less pretentious now. Even if these are again neither "groundbreakers" nor “trendsetters”, they are in a sense “curators” of the glamour and artistry that was the domain of perfume and fashion back in the days when Chanel has initiated this successful reunion. I searched in vein for a website for that magazine, to be able to prove to you it even exists, but I did come across this short film, also interviewing the in-house Chanel perfumer for the past 30 years or so, and I couldn’t’ agree more with what he said, as artsy as it may sound. Bois des Isles, originally uploaded by Ayala Moriel. She sits at the café. She just arrived from another era. She is not quite sure where she is, but she can recognize an urban heaven when she sees it. In her lacy gloved hand, she slowly lifts a lided paper coffee cup, and indulgently sips the warm elixir inside. Peacefully watching passers by as if completely unaware that she is the one who’s being watched. 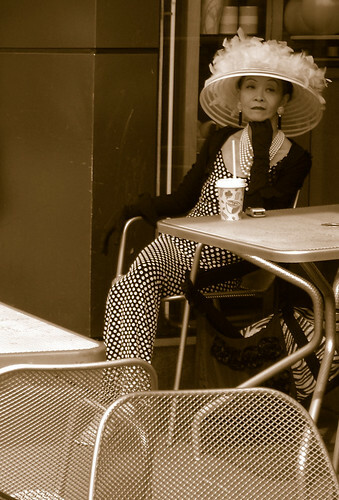 With her striking European chic outfits, complete with brimmed hat, carefully made-up brows and powdered face and dark lipstick her presence is enigmatic and foreign not only to her Asian features but also to the laid-back Pacific Northwest’ small-town mentality. And just as her entrance into our lives was mysterious, so was her sudden disappearance one summer day. All I could gather was that I was not the only one sneaking curious gazes at her lacy brimmed hat and gloves, wondering if they might be covering some dreadful secret rather than evidence that she was indeed a time traveler… All I know is that she was not a hallucination of my dreams. Besides my success at capturing her image with my digital camera, I also found out that she disappeared on August 6th, 2007, and left behind a trail of mystery, including puzzled baristas who remembered her favourite drink was French Vanilla coffee – nothing fancy, just straight from the tap. Perfume transcends the intangible mystery of time. And just like the presence of the mysterious time traveler, it enters our life suddenly and disappears without warning. Perhaps this was why when I saw her I smelled a phantom breath of Bois des Îles: a perfume that silently entered my consciousness and whose beauty I was unable to appreciate years ago because of its antiquated aldehydic moments and the vagueness of its intentions. Years later, my reflections on Bois des Îles have been refined and clarity is starting to bring me more pleasure from this jus treasured within the crystal cut flacon. 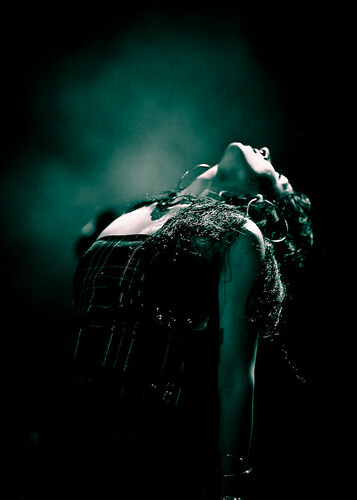 Without taking away from its mystery I can enjoy it and indulge in discerning the notes as they lazily dance on my skin. First come bergamot and aldehydes, which take some time to fade away. They are oily and bring to mind the somewhat uric aspect of sandalwood, and the somewhat sharp (at first) nuances of heady ylang ylang. As the aldehydic cloud settles, Bois des Îles becomes deliciously warm, with the spiciness of dry ginger and nutmeg. Sandalwood embraces the perfume throughout its evolution. Although there are floral notes in the heart (namely jasmine and rose), ylang ylang is the only one that truly stands out. The others are blended to complement the sandalwood and ylang ylang (smoothing and rounding its sharpness) and bridge from top to base and the crisp-woody notes of vetiver. And in the final movement choreographed on my skin, the sweetness of vanilla absolute, tonka and benzoin feels like a silky caress of soft lips and warm sand. P.s. 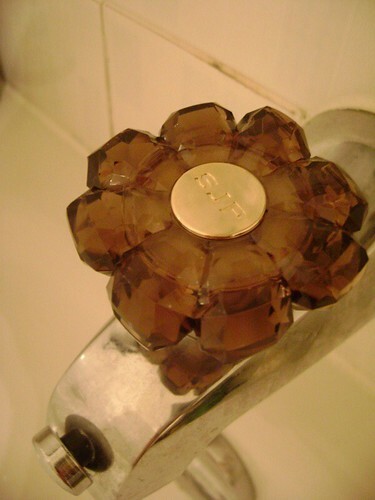 This review is for the pure parfum, which unfortunately is no longer available in the Chanel boutiques as the beautiful and elegant crystal flacon of this jus had to make room for the ridiculously gigantic Eaux of the Les Exclusifs. Let’s hope the executives at Chanel smarten up and bring it back. After all, the extraits are the best way to wear the Chanel classics. P.s.s. Coffret of vintag Chanel flacons was taken from this auction. 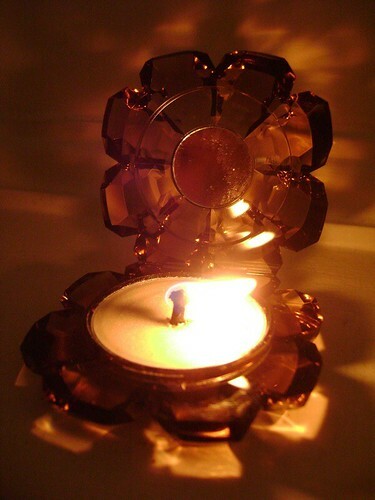 Covet Candle, originally uploaded by Ayala Moriel. Covet Cellphone, originally uploaded by Ayala Moriel. Voted the styliest phone of 2007. No wonder we didn't notice Carrie's cellphone through all those seasons! 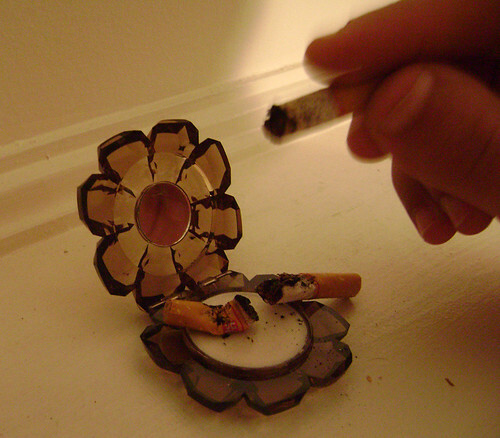 Covet Ashtray, originally uploaded by Ayala Moriel. Covet Buckle, originally uploaded by Ayala Moriel. A similar design was spotted on a young labourer with his buckled jeans. Covet Ring, originally uploaded by Ayala Moriel. Who needs an engagement ring when you've got such a jewel hangin' on your fingers? This is clearly more precious than diamonds. Look at that glow! Covet Manolos, originally uploaded by Ayala Moriel. 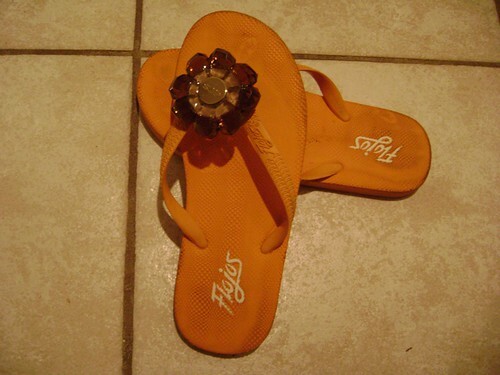 And you wouldn't believe my story if I didn't show you this last artifact - Carrie's Manolo flip flops with the very same floral motif. It must have meant something really important to her. It even matches the blotches of beach dirt from The Hamptons on this golden number. Wow! 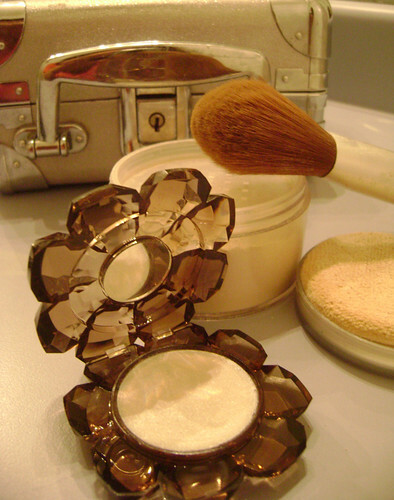 Covet Powder, originally uploaded by Ayala Moriel. Now, what about the scent? How does Covet smells like? The EDP and the solid perfume are quite different. I've go the solid perfume because they didn't have the samples. Yet. Don't make that mistake, or you'll end up with a series of photos like the ones you've just observed. Instead, try the EDP testers. That Back to School Smell, You Know What I'm Talking About! , originally uploaded by giggle1025. Was the excitement the one which created that special smell that filled the air year after year, grade after grade on September 1st? The scent of myriads of sharp pencils, new books, backpacks, shoes and everything along with freshly sanitized classrooms and the first tangerines – still green – packed for the 10 o’clock break by all the lucky students - theses simply cannot explain this strange phenomenon. I can smell hints of the September 1st smells sometimes when I enter art and office supplies stores, but it’s never quite exactly the same. There must be something, some kind of a hormone responsible for this particular scent. Perhaps an enourmous amount of pheromones exuded from hundreds of young students with mixed feeling of excitement – consisting of fear from the unknown and thirst for learning – along with that of teachers’ attitude towards another year confining themselves and the youngsters between the walls of artificial intelligence-injection institution. Perhaps it is the sleepless night that preceded September 1st that causes this feeling. It must create a particular illusion of the September 1st smell in one’s brain, when they least expect it. Proof: I had a good nights sleep and I can’t smell it right now! However, every time I visit my daughter’s school at the beginning of the year, I smell it. Even though it’s in a completely different country than where I grew up in. The school sanitizers here don’t smell the same. The pencils might even be made from a completely different type of wood. And there are none of those first tangerine I told you about to be seen for a million miles and not until Christmas really. I called my daughter’s teacher on the phone a few days ago to confirm our parent-teacher conference time - apologizing for disturbing her last days of summer vacation. But I didn’t need to apologize: she was in the class herself, getting ready for the school year already. I bet she was busy preparing that little atmosphere device that releases the September 1st smell all over the school on the first couple of days for when the students return to their desks. Teachers across the world spend all summer making sure their scent is synchronized and that on that very first day, all schools around the world will smell the same, and that these little students will never forget them. They might have had to vow an oath of secrecy before getting their licenses, to never reveal the secret of this ancient scent. If you’re a teacher, please come forth and shed some light on this mystery. I promise to keep your reply anonymously.